September 26, 2011  David Greene talks with NPR's Cokie Roberts about the week in politics, including the possibility of a government shutdown on Friday. September 19, 2011  As part of his plan to reduce the federal budget deficit, President Obama is expected to propose a tax aimed at the wealthy. Republicans have countered that any tax on millionaires would be "class warfare." September 12, 2011  Hope for the future, rather than pessimism about it, characterized the remarks of many of the speakers at events commemorating the 10th anniversary of the Sept. 11 attacks. Sunday's ceremonies, and the display of political unity they expressed, were very different from what's been going on lately on Capitol Hill. September 9, 2011  Melissa Block speaks with our regular political commentators E.J. Dionne, of the Washington Post and Brookings Institution, and David Brooks, of the New York Times. They discuss President Obama's jobs speech, and how the jobs issue is playing on and off the campaign trail. September 5, 2011  President Obama is scheduled to deliver a long-awaited speech on jobs this week, as polls are showing huge voter disillusionment with government. As well, the lack of confidence is making economic recovery efforts that much more difficult. September 2, 2011  For a look at this week in politics, Robert Siegel talks to political commentators E.J. Dionne, a Washington Post columnist and fellow at the Brookings Institution, and David Brooks, a columnist for the New York Times. September 1, 2011  If manners maketh the man, then speeches can offer a rare glimpse into the true nature of our political candidates. Foreign Policy's David Rothkopf thinks that Mitt Romney's remarks indicate a force to be reckoned with. August 31, 2011  Is Libya's uprising worthy of emulation this early in the game? The Nation's Robert Dreyfuss doubts it. While the powers that be debate the next steps for Syria, it set a precedent for the rest of the Middle East. Weekly Standard: A 'Model' Nation for Syria? 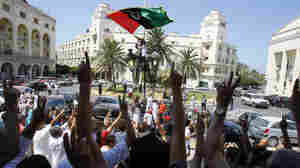 August 31, 2011  In the tumult of rebellion across Africa and the Middle East, does Libya lead the pack? Lee Smith of The Weekly Standard contemplates the international posturing of Syria against the background of upheaval—and what it can learn from Libya in its relation with the U.S.
August 29, 2011  Major storms like Hurricane Irene often bring with them political consequences. Over the last few days, politicians from the president on down to local mayors, have been showing up on the airwaves. August 27, 2011  This week, Fed Chairman Ben Bernanke slammed political gamesmanship and one Republican on the congressional supercommittee suggested that tax breaks on everyday Americans could be allowed to lapse. Host Laura Sullivan speaks with James Fallows of The Atlantic about these stories and others. Is Libya's Conflict The First 'True Arab Revolution'? August 27, 2011  For the first time in more than four decades, Libyans have the opportunity to create a government on their terms. Even though Egypt and Tunisia have reached those crossroads, Libya may be set up for a more successful outcome. Is Libya The First 'True Arab Revolution'? August 26, 2011  Robert Siegel discusses this week in politics with David Brooks of The New York Times and Joy-Ann Reid, managing editor for Grio.com — an NBC News site focused on the African-American community.